After it was revealed that Bill and Hillary Clinton have earned $30 million in the last 16 months, the House Oversight panel backed a measure that would limit taxpayer dollars on expenses incurred by ex-presidents earning more than $400,000 a year. The measure, passed by a voice vote, would set presidential pensions at $200,000 a year, with another $200,000 set aside for office space and other expenses, the Associated Press reported. The bill would then reduce expense payments by $1 for every dollar above $400,000 earned by a former president. If an ex-president earned more than $600,000 a year, they would not receive federal funds for office expenses or travel. Their “widow or widower” would see an increase in their monetary allowance from $20,000 per annum to $100,000. 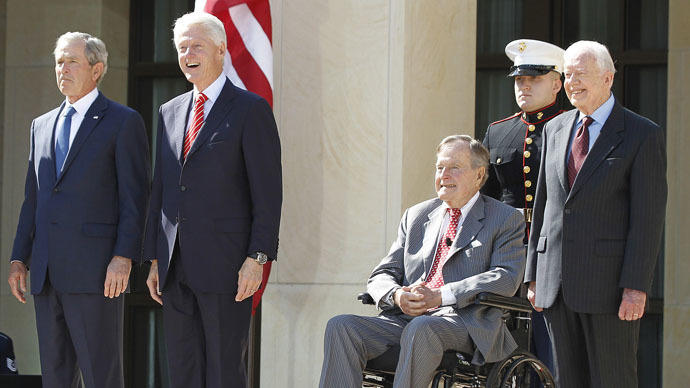 US taxpayers shelled out $3.5 million in pensions and benefits last year to four living former presidents – Jimmy Carter, George H. W. Bush, Bill Clinton and George W. Bush. An additional $1.3 million was spent on George W. Bush and $950,000 on Clinton for their respective office spaces in Dallas and New York. Chairman of the House Oversight panel, and co-sponsor of the bill, Rep. Jason Chaffetz (R-Utah) said the bill wasn’t aimed at anyone in particular, but was simply a matter of fairness. "History shows that former presidents do very well financially after they leave office," Chaffetz said in a statement before Tuesday's vote, according to the AP. "In fact all former presidents are millionaires, making it unlikely that they depend upon their taxpayer-funded allowance to make ends meet." Chaffetz introduced bills similar to the President Allowance Modernization Act in the past two congressional sessions. If passed into the law, it would amend the Former Presidents Act of 1958. Both Clinton and George W. Bush have earned millions of dollars in speaking fees since leaving office. Just last week, Hillary Clinton’s presidential campaign team released Federal Election Commission financial disclosures showing the Clintons had earned $30 million in speaking circuit fees and book royalties in the last 16 months. The revised bill does not affect money spent by the Secret Service to protect the former presidents and their families.